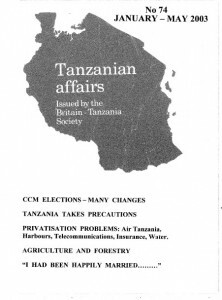 PRIVATISATION PROBLEMS: Air Tanzania, Harbours, Telecommunications, Insurance, Water. Crucial elections for leadership positions in Tanzania’s ruling Chama cha Mapinduzi (CCM) Party took place throughout October all over the country and prepared the way for a series of elections which will take place over the next three years. These are the 17 parliamentary by-elections in Pemba (the smaller of the two main Zanzibar islands) in 1993, (see recent issues of TA), local elections throughout the country in 1994 and the presidential and parliamentary elections in 1995. The by-elections will be the first real test of political opinion in Pemba since 2000. As both the 1995 and 2000 elections in Zanzibar were widely considered to have been flawed, the results of these by­elections (if they are free and fair) should finally indicate exactly how popular the CCM and the main opposition party -the Civic United Front (CUF) -are in Zanzibar. The CCM elections were in three stages. The first stage elected leaders for ward, district and regional party posts all over the country. Some 1,600 elected delegates then came together for the second stage -elections to the 85-strong National Executive Committee (NEC). These positions are elected by five different groups: women (20 seats), youths (15), parents (10), Zanzibar (20) and the Mainland of Tanzania (20). President Benjamin Mkapa, who has retained widespread popularity and respect after seven years in power, was comfortably elected as National Chairman of the Party and, following the decision of the current Vice-Chairman for Zanzibar, former Zanzibar President Salmin Amour, not to enter the contest, Zanzibar’s present President, Amani Karume, was elected to this post. Describing the qualifications needed for these topmost positions, Party Secretary General Philip Mang’ula (also comfortably re-elected), listed allegiance to the party, readiness to defend it, to explain its policies, honesty, hard work, vision and wisdom. Political party representatives from 15 countries including Zambia, Zimbabwe, Korea, Rwanda, Mozambique, Cuba, China, Namibia, and the South African ANC participated in the CCM conference. The results of the second phase once again showed the remarkable unity of the party -one of the factors largely responsible for keeping it in power since independence in 1961. However, there were, as usual, many changes -six ministers and junior ministers, including Minister of Higher Education Pius Ng’wandu and several regional commissioners lost their seats. Delegates ensured that some of the oldest colleagues of the late Mwalimu Julius Nyerere preserved their positions in the NEC. Notable for his durability among these is former Prime Minister, 68-year-old John Malecela, who obtained 99.98% of those voting when he was again nominated as party Vice-Chairman for the mainland. He had tried for the presidency in 1995 but had been vetoed by Nyerere (on allegations of corruption); he has been hyper­active in the party for over forty years. Other leaders elected to the NEC included Prime Minister Frederick Sumaye (who came first on the mainland list), Party Secretary General Philip Man’gula (second), East African Legislative Assembly Speaker Abdulrahman Kinana (fourth) and the Party’s veteran socialist Kingunge Ngombale-Mwiru (fifth). There was some new blood too ­38-year old Ramadhani Maneno defeated veteran party leader and former Press Secretary to Mwalimu Nyerere, 69-year-old Paul Sozigwa, as the NEC Member for the Coast Region. The most popular of the defeated presidential candidates in the 1995 elections, Foreign Minster Jakaya Kikwete, who came twelfth in this NEC election, and Minister of Water and Livestock Edward Lowassa, who was fifteenth, are still likely to try again for the presidency in 2005. The third stage of the elections was for the 24-strong Central Committee (CC), a relic of the socialist days when the party’s structure was closely modelled on that ofthe Communist world where power was always concentrated in secretive Central Committees. This committee remains the Party’s key policy making body. Its new composition gives further guidance as to who might obtain the much coveted nomination as the party’s candidate for president in 2005. Those at the top ofthe poll included Kingunge Ngombale-Mwiru and the only Asian NEC member, Minister of Tourism Mrs Zakia Meghji, but neither ofthese are likely to compete for the presidency. Dr Salim Ahmed Salim consolidated his position as a possible future president of Tanzania by becoming one of seven new members from Zanzibar. Jakaya Kikwete kept his seat on the Central Committee. Among those defeated was another possible presidential aspirant, Minister of Trade and Industry Dr Juma Ngasongwa. Julius Nyerere reigned as the first President of Tanzania for 22 years and then made sure that it was his choice, Ali Hassan Mwinyi, who became the second President in 1985. With multi-partyism in 1992 it became more difficult for him to arrange things his way, as seventeen top leaders of the Party threw their hats into the ring and vied to become the chosen candidate for the presidential election in 1995. Nyerere needed all his considerable powers of persuasion and guile to ensure that his favourite, Benjamin Mkapa, became the third President. Mkapa cannot stand for a third term as Nyerere established the rule under which presidents can only serve for two terms and none of the subsequent presidents, including many presidents of Zanzibar, have been able to change this. The previous President of Zanzibar Dr. Salmin Amour tried very hard to do so but did not succeed. All the recent CCM elections were hard fought. Needless to say they provoked intense rivalry and there were many allegations of bribery. One CCM delegate in the Mwanza Region was quoted in Mtanzania as saying that election bribes of from Shs 5,000 (£4) to Shs 50,000 were common and that he wanted more frequent elections “because we get lots of bribes”. In Kilimanjaro Region the Prevention of Corruption Bureau (PCB) was said to be investigating complaints of bribery. One cynic was quoted in the press as saying “There must be something good in it to make the old guard hang on for a lifetime”! These elections were made more significant because most of the 15 opposition parties are continuing a process probably best described as ‘self-destruction’ thus ensuring that the person chosen as CCM presidential candidate will almost certainly become the next president of Tanzania in 2005. Former Secretary General of the OAU, Salim Ahmed Salim, who has been away from Tanzania for many years, successfully presided over a recent seminar in Parliament on the future of democracy in Tanzania which was attended by virtually every top leader in the country; he is from Zanzibar and it has been the custom for the presidency to rotate between Zanzibari and mainland personalities; it may now be Zanzibar’s turn again. Others who have just been elected to the NEC and are likely to vie for the CCM presidential candidate position include: Foreign Minister Jakaya Kikwete who came second to Mkapa in the ballot for candidate in the 1995 elections; Edward Lowassa who was also near the top in those elections; Minister of Transport and Communications Prof. Mark Mwandosya, whose cause may have been damaged however because of the serious rail accident in which 280 people were killed on June 24 this year; Works Minister John Magufuli; and, Trade Minister Juma Ngasongwa who has recovered from accusations of corruption some years ago. Tanzanian Vice-President Dr Ali Mohamed Shein, who was picked from obscurity in July 2001, following the death of his predecessor, Dr Omar Ali Juma, is a possible candidate as is Prime Minister Frederick Sumaye. There will be other aspirants as the election gets nearer. Most of the smaller parties have problems. In July the Central Committee of the United Democratic Party (UDP) suspended its Chairman John Cheyo (former head of the Finance Committee of the National Assembly) allegedly for misappropriating party funds. Since then Cheyo has been trying to regain his position but Political Parties Registrar John Tendwa sided with the rebels in the party and recognised the acting chairman, Armani Nzigili as the new chairman. The matter is now in court. The National Convention for Construction and Reform (NCCR­Mageuzi party), under its then leader, former Deputy Prime Minister Augustine Mrema, gained 28% ofthe votes in the 1995 election. After Mrema departed, amidst much acrimony, to re-establish himself as leader of the Tanzania Labour Party (TLP) the NCCR was left with only one MP and he recently lost his seat. According to the Guardian, the party now appears to be splitting between those wishing to come closer to the CCM and others wanting to continue as a separate party. Party leader James Mbatia has been going around the country terminating the membership of many long­standing members on the pretext that they have been disloyal to the chairman. The NCCR-Mageuzi began to seek, early in December 2002, a High Court Order allowing it to institute a suit against the Government in relation to the latter’s claims that the party had been registered without fulfilling all the required conditions. This followed the receipt of a letter from the Registrar of Political Parties asking the party to provide it with a PP.5 form indicating the names of its supporters from the 10 Mainland and two Zanzibar regions – a requirement for registration as a party. The NCCR insisted however that the correct form had been presented to the Registrar on January 7, 1993. Augustine Mrema has been chosen as a presidential candidate by the TLP but his main contribution is likely to be to damage opposition hopes of winning next time as he will divide the opposition vote. The leader of the new and very small Democratic Party (DP), Christopher Mtikila, has just been cleared of charges of sedition made against him following speeches he made in November 1999 in which he severely criticised Father of the Nation the late Julius Nyerere. Some other opposition leaders including the Secretary General of the NRA party, the Deputy Secretary General of the TLP and the National Chairman of the TPP have defected to the ruling CCM Party. On the opposition side there is at present only one serious candidate for the presidency of Tanzania -Prof. Ibrahim Lipumba, head of the strongest opposition party, the Civic United Front (CUF). But even his party, which is generally well organised, has its problems. Its leadership tried earlier in 2002 to unseat four of its nominated women MP’s because of their failure to join other CUF MP’s in boycotting Parliament. This boycott followed the serious rioting in Zanzibar in January 2001 which reflected the party’s dissatisfaction with the conduct of the 2000 elections. But the High Court has already ruled that three of the four could not be removed, under the party’s constitution. More serious for the party were rumours that Zanzibar Party leader and CUF Secretary General Seif Shariff Hamad, who, it had been assumed, would be the party’s candidate for President of Zanzibar, may now be facing a dissident group calling itself the ‘G7’. This group is said to be campaigning instead for CUF Deputy Secretary General Juma Duni Haji, as the candidate. Haji served a long time in jail in Zanzibar on charges which were abandoned immediately after the last election. Parliament has passed a new amendment to the Elections Act under which persons petitioning against the results of a parliamentary election must deposit 5,000,000 /-as security for costs. The Court of Appeal had declared the Act unconstitutional, saying the amount would bar poor people from seeking their rights in the courts, as guaranteed by the country’s constitution. The Amendment gives courts discretionary powers to determine the amount, which should not exceed 5,000,000/- and should be related to the petitioner’s economic means. Before the 5,000,000/- requirement was introduced, petitioners were required to deposit 500/- as security for costs. Implementation of the remarkable Muafaka (agreement) of 10th October 2001 (detailed in TA No. 71) between the then warring CCM and CUF parties continues to proceed fairly well. The Presidential Commission investigating the disturbances in Pemba in January 2001 has interviewed some 1,400 people and has published its report. The report has criticised the police for killing 30 persons but pointed out that if they had been better equipped they might not have needed to use their rifles against the rioters. (We hope to have more details of the report in our next issue -Editor). Of all the issues which divided the nation and resulted in the rioting, the composition of the Zanzibar Electoral Commission (ZEC) was considered to be crucial. The Zanzibar Constitution has now been amended and a new Zanzibar Electoral Commission (ZEC) has been appointed with four members who have CCM sympathies and two members nominated by CUF. Members of the new ZEC were sworn in at a ceremony at State House attended by people from all parties. Another indication of progress in implementation of the agreement has been regular meetings between CCM President Amani Karume and leaders of opposition parties. Furthermore, an amendment to the 1984 Electoral Law, passed by the House of Representatives on October 2nd, has established a permanent register of voters. It is hoped that this will remove fears expressed by CUF that CCM had been cheating in earlier elections by bringing voters to the islands from the mainland. But political development rarely goes entirely smoothly in Zanzibar. The Guardian reported on October 3 that the government, against strong CUF objections, had found it fit that community leaders, popularly known Shehas (local leaders regarded by CUF as CCM sympathisers) should continue to co-ordinate the voters’ registration exercise because of their local knowledge. CUP Secretary General Seif Sharrif Hamad later met with President Karume to register his objections to the continued use of Sheha’s. The Government has also decided that a simple majority, rather than 50% of the voters, should determine the winner in a presidential election race and that the number of constituencies should be reduced, particularly in the CUF stronghold of Pemba. Minister of State in the President’s Office (Constitution and Good Governance) Omar Makungu said that the decision to introduce the simple majority system in determining the winner of a presidential race was aimed at improving multi-party democracy in the Isles. The 50% winning system was adopted during the single-party era. With the introduction of multi-partyism it was imperative for the system to be changed. It is understood that the Government does not want the new electoral system to be made effective until the 2005 elections but CUF wants its introduction by March 2003 in time for 16 key by-elections in Pemba in constituencies won by CUF in 2000. The 16 former MP’s were expelled from the House of Representatives after they had boycotted proceedings following the disturbances. There is one by-election in Pemba in a seat held by CCM. This arose when Vice-President Shein was chosen by President Mkapa to move to Dar es Salaam to take up his new position. If these by-elections are free and fair, the results will indicate clearly, for the first time since multi-partyism was introduced in Tanzania, whether CUF has the electoral support in the Isles which it has always claimed it has. It believes that it was deprived of victory in the 1995 and 2000 elections. Director of Criminal Investigations Adadi Rajabu was quoted in the East African on December 2 as saying that security had been heightened at all airports, border crossings, around the Zanzibar Isles, at hotels and major installations following the terrorist attack on the Paradise Hotel in Mombasa on November 28. The Director called on Tanzanians to report to the police any ‘suspicious looking’ people who might threaten the security of the country. In Zanzibar, the police have assured foreign visitors and tourists of protection from terrorist threats by providing 24-hour police and security forces protection. These measures have been taken in view of what happened in August 1998 when the US embassies in Nairobi and Dar es Salaam were bombed by al Qaeda terrorists resulting in the deaths of over 250 people. The majority of tourists to Tanzania come via Kenya. Police sources in Dar es Salaam were quoted as saying that the porosity ofthe borders in East Africa, the unguarded coastline and the cultural ties between people in Kenya, Tanzania and the Gulf States, made East Africa a soft target for terrorists. Zanzibar Commissioner of Police, Khalid Iddi, was quoted in the same article as saying that police had mounted night patrols along the coastal areas of Zanzibar, Mafia Island and Mtwara using Zanzibar’s Kikosi Maalumu cha Kuzuia Magendo (KMKM -anti-smuggling unit). “We’re working around the clock” he said. Mr Iddi said police and security personnel had been instructed to search every person entering Zanzibar. The police have also stepped up their search for Mohammed Ghailan, a Zanzibari national with Iranian connections, who is suspected to have financed the 1998 bombing in Dar es Salaam. He is listed by the US government as one of its 10 most wanted terrorists. President Benjamin Mkapa was among the first heads of state to send his condolences to the people of Kenya and to President Arap Moi after the bombing in Mombasa. A ‘Protection Against Terrorism Bill’ presented to the National Assembly on November 4th attracted considerable criticism from MP’s. The Government stressed that a terrorist network had manifested itself with the August 7, 1998 blowing up of the American embassies in Dar es Salaam and Nairobi. A Tanzanian, Khalfan Khamis Mohamed, had been sentenced to life imprisonment in the US and another Tanzanian, was on the wanted list. Shadow Minister for Home Affairs, Dr. Wilbroad Slaa (CHADEMA Party), was quoted in the Guardian as urging the Government to listen to concerns about the Bill and warned Tanzania against enacting legislation because of pressure from the United States. Dr. Slaa wondered how people could be arrested prior to investigations. Suspected terrorists should not have to bear the burden of proof; the prosecution should prove such persons guilty. The Bill was contrary to laws operating in the Commonwealth and would suppress civil liberties. MP Ireneus Ngwatura (CCM) said the Bill did not define terrorism. Prof. Daimon Mwaga (CCM) said terrorism should not be associated with any religion and whoever associated Islam and Christianity with terrorism should not be allowed to derail the good intentions of the Bill. Prof. Juma Mikidadi (CCM) also expressed reservations on what terrorism meant and asked for a definition of the word terrorism and how it differed from freedom fighting. Was it fair, he asked, to call Palestinians fighting for their rights, terrorists. Ambassador Ahmed Diria (CCM) said nobody would be safe unless every country abided by UN Security Council resolutions against terrorism. According to him, there was state terrorism and individual terrorism, but each nation defined terrorism according to its own national interests. Other MPs protested about the provision which [sic]. At the end of the debate in Parliament a vote was taken. The Deputy Speaker of the House announced that there had been more ‘yes’ voices than ‘no’ voices and declared the Bill passed. At this point all opposition MPs marched out in protest. Muslims in Morogoro had issued a statement at the end of October condemning the Bill and calling on MP’s not to pass it. They said that poor countries were being bulldozed by the USA and its allies. CUF Chairman Professor Ibrahim Lipumba had been quoted earlier as saying that the Bill would deprive citizens of what they considered to be their rights; it allowed the government to control civil society; it contravened the constitution and did not give a specific definition of terrorism. Police would be given the power to arrest people even without an inspection warrant. President Mkapa in a radio address on 30th November said the Bill was aimed at combating crime and was not aimed at any religion or political party. He said that Tanzania could not take terrorism for granted or let the country be a place in which terrorists could hide. One year after September 11 and allegations that Tanzanite gem miners were involved with the financing of Al Qaeda, a slight improvement in the Tanzanian Tanzanite trade has come about. American dealers Zale and Tiffany’s have begun to purchase Tanzanite again after consultations with a US-based ‘Tanzanite Task Force’ which was set up after the signing of the Tucson protocol by the two governments in February 2002. This largely ended speculation about al Qaeda involvement in the Tanzanite industry. The Express reported on 24th August that the ‘National Population and Household Census’ which took place in August had had to be extended by a few days in order to give time for all returns to be completed. Census officers faced a variety of unexpected problems. In Mbulu District the hunter-gatherer Hadzabe people requested the provision of bhang, illicit brew, monkey meat and cigarettes before they agreed to be counted. The local Council offered to provide zebra meat but the Hadzabe refused to accept this saying they were not used to it. Eventually the Council provided them with monkey meat also. About 100 Hadzabe thanked the Government for considering their request and said the gesture had succeeded in bringing them together to be counted. Their request for bhang and illicit brew was not acted upon. Clan leader Salbogo Dofu asked the Government to allocate them special areas in order to avoid interference with the regular livestock and farming activities which destroyed their natural food. The reserved area should contain the fruits, roots and animals that they normally ate. According to the 1988 census there were 1,000 Hadzabe in the area but the number had since been reduced to about 800. They lived mostly in caves and were found in Karatu, Mbulu, and Ngorongoro districts in Arusha Region. Some Maasai people maintained that being counted was against their customs and ten Italian tourists in Zanzibar refused to be counted on grounds that they were foreigners and were just travelling in the country. It took the hotel management half an hour to persuade them to comply with the rules. Asked recently why Tanzania had been chosen to host a symposium on deepening democracy in Africa, UN Development Programme Resident Representative in Tanzania John Hendra was quoted in the Guardian as saying that it was chosen because of its low ranking, in terms of income per capita and the Human Development Index, and the number of achievements that Tanzania had made in moving forward in democratic governance. For example the transition to a multi-party system, the implementation of a number of government reforms, liberalisation of the media, efforts being made in the anti­corruption strategy and the home-grown and very important Muafaka in Zanzibar. The Representative went on to point out that urban poverty, particularly in Dar es Salaam, had declined from 28 % to 18% and that some of the indicators on primary education had been extremely positive. Primary enrolment had increased in the last few years more than it had in recent decades. He said that Tanzania was a model because of its sense of national ownership of its poverty alleviation policies. Dar es Salaam has also been chosen by the IMF and the World Bank as the site of the first ever ‘Development Acceleration Regional Centre.’ This centre will be charged with the provision of locally­based technical assistance and training in the Fund’s core areas of expertise -macroeconomic policy, tax policy, revenue administration, public expenditure management, and building sound financial sectors -Sunday Observer. A new Bill placed before Parliament has put local and foreign NGOs under state control. All NGO’s will be under a Council to be appointed by the Government. The Council will have the power to register and revoke NGO’s as well as to co-ordinate their activities. The Bill attracted much criticism especially from foreign aid donors. A US spokesman said his country believed in the right of NGO’s to operate in an environment free from overly burdensome registration requirements and regulatory oversight. The Head of the Africa section of the Swedish International Development Agency (SIDA) was quoted in Mtanzania as saying that to put civil organisations and NGO’s under restrictive legislation would have a negative impact on the country’s development. Sweden was working closely with NGO’s because it considered them to be part and parcel of its relationship with Tanzania. As the time for the Bill to be debated in Parliament approached, various NGO’s conducted what the Guardian described as ‘a spirited campaign’ against it. This involved dozens of lobbyists airing their concern that the Bill would be inconsistent with the rights to freedom of association. Prime Minister Frederick Sumaye spent six hours ‘grilling’ district commissioners and council executive directors from 18 districts on November 26th They had allegedly failed to spend over 2bnl-for the development of primary education in their areas. The DCs and council directors carried bundles of papers in support of their cases. On November 15, Sumaye had described the DCs and directors as incompetent; he said the funds were lying idle in councils and primary school committee accounts while the shortage of classrooms still persisted in their areas. The amounts unused varied from Kahama (293.6m/-) to Morogoro (105.2m/-). Also on the list were the municipal councils of Kinondoni (l53.5m/-), Temeke (l49.0m/-) and Shinyanga (102m/-). The Ombudsman’s Office for two World Bank agencies dismissed, at the end of October, the complaint by the Tanzanian Lawyers Environmental Action Team (LEAT), filed on behalf of the Small Scale Miners Committee of Kakola Village in Shinyanga, which had alleged that 52 miners were killed at Bulyanhulu Gold Mine in mid­1996. According to the ‘Assessment Report Summary’ on the complaint, dated October 21 and sent to the LEAT representative in Washington, and the ‘Office of the Compliance Advisory/Ombudsman’ (CAO) for the ‘Multilateral Investment Guarantee Agency’ (MIGA) there was insufficient evidence to support the alleged deaths. The report followed independent investigations by a Principal Specialist from the Ombudsman’s office. It noted that even though the CAO had no mandate to investigate allegations made against Tanzania, the events of 1996 took place before the World Bank Group had any interest in the mining operations and more than three years before MIGA offered a guarantee. However, as the allegations provided a risk to MIGA in its decision to offer a guarantee, the CAO was interested in examining the case. Referring to LEAT’s video evidence, the CAO said that it could not verify from the video, the location, date, timing or other details. The CAO found witnesses and other contemporaneous documentation that refuted the LEAT version of events. On the issue of compensation paid to small scale miners at the time of the order to vacate the land in 1996, the CAO stated that this was a matter which fell within the government’s exclusive jurisdiction as at the time the mine was not a project of the World Bank Group. The CAO had asked for a list of names of the 52 people alleged to be having been killed but neither LEAT nor the Small Scale Miners Committee had been able to supply such a list. Amnesty International had recognized that the evidence for the deaths of 52 people relied on accounts supplied by people who were not present in the area at the time. Amnesty International never investigated the allegations itself and never went to the site or met with local people, eyewitnesses, the company or others. The LEAT President was later quoted in the Guardian as saying: “This report is completely biased. It favours MIGA. We shall tirelessly fight on. There are a lot of untrue and unjustified remarks in the report. It evades our submissions and evidence adduced. We have an uphill task to fight the giant Barrick Gold Company”. The country’s only coffee research institute, Lyamungo Agricultural Research and Training Institute (LARTI) in Moshi, has been privatised and renamed ‘The Tanzania Coffee Research Institute’ (TACRI). Sources in Moshi quoted in the Guardian (October 19) said that, following the Government’s decision to relinquish direct running of the institute, a new management team under former Minister for Finance, Edwin Mtei, had started afresh with a new team of researchers. These had replaced some 60 existing staff who had been distributed around other research stations. But many stakeholders, including coffee growers, expressed concern that this might bring to naught all the good work done in more than 60 years of research at Lyamungu. The 2,000 employees of the Forestry and Beekeping Division of the Ministry of Natural Resources and Tourism have been told that their Division will be transformed into an Executive Agency in 2003. They immediately demanded that they be paid their terminal benefits before the change is made -Guardian. The Protection of New Plant Varieties (Plant Breeders’ Rights) Bill of 2002 which has established a ‘Registrar of Plant Breeders Rights’ and is aimed at encouraging competition in research and seed production and hence, hopefully, more easily affordable seed, came under attack from several MP’s. One asked whether this Bill would not become an umbrella to defend the interests of international seed companies after the collapse of Tanzania’s parastatal TANSEED Company. Another MP said it was dangerous to depend totally on foreign seed companies. One MP asked the Government to act as a guarantor to researchers to enable them to access credit for their research from banks. Another complained that the Bill was not understandable. The Arusha Times (2nd November) reported that Tanzanian botanist Sebastian Chuwa had been chosen as an Associate Laureate in the Rolex Awards for Enterprise Competition for 2002. He is a member of the African Blackwood Conservation Project. The Rolex Awards for Enterprise recognise ground-breaking projects in the areas of Technology, Science, the Environment, Exploration and Cultural Heritage. Each associate laureate receives $35,000 and a steel and gold Rolex chronometer. Sebastian Chuwa won his award for his work on the preservation of the African Blackwood. The Guardian reported on October 30th that the government was facing a possible loss of Shs 40 billion during the next agricultural season if no solution could be found to the problem of transportation of tobacco fertiliser. Tobacco Board General Director Clemence Kilala was quoted as saying that the Tanzania Railways Corporation had too few wagons to transport some 3,500 tons of fertilisers due to be sent to Tabora, Rukwa, Shinyanga, Singida and Kigoma and had to be received by not later than the third week of November. Tobacco is the 4th biggest crop in the country and creates substantial employment opportunities.